A driving movie featuring a Starbucks double-shot espresso. Derrick Oien: "MP3.com was always focused on the collection of data from every point we could collect it." AP: "For 29 years the brothers have kept their same-card exchange going." 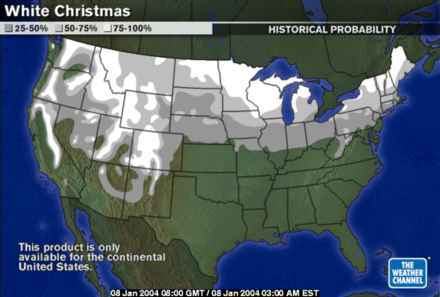 Weather.com: "This map shows the probability of having at least one inch of snow on the ground on Christmas morning." I heard a rumor that Scoble was becoming an O'Reilly author. One of the reasons I wanted to be in Washington on Election Day was so I could have a vote that mattered. I voted for the Democratic candidate for governor, who, in the latest count, is ahead by ten votes. If I hadn't voted maybe it would have been nine. Minnesota Public Radio reports on Time's Blog of the Year, which is from Minnesota. I learned about it from MPR's RSS 2.0 feed. Nicco Mele: My first podcast. Does the US Dept of State have a weblog? I found this post in their RSS feed. Starting to look pretty bloggy. On the road again today. Heading over the Bay Bridge for a breakfast in Berkeley, then over the Sierra to Reno, then south toward Las Vegas. I'll have Inkernet this evening, one way or the other. I landed in Fernley, Nevada for the night. Good wifi. Believe it or not I got an email from a grouch that says he doesn't want me using the term Inkernet anymore. It takes all kinds to make the world go round. Brrr. It's kinda cold here. Low tonight 11F! Four years ago: "I've loved quite a few shicksas." Last update: Wednesday, December 22, 2004 at 9:09 PM Eastern.